Spacers or separators are small rubber bands that increase space between two teeth so that a band (brace) may be placed around the tooth, usually a back tooth. Spacers may cause tenderness for a few days. Take Tylenol or Advil as needed. Softer foods may be necessary as well. No sticky foods. This includes gum! Brush over spacers, but DO NOT floss in spacer areas. If a spacer falls out and let us know. We will inform you if it is necessary to have it replaced or if it will be OK until your next appointment. This can be the most bothersome step for some people, so if this is the case with you, be patient, it will get better and it will all be worth it. Please turn your expander as Dr. Murphy and her staff have instructed you. Turn at the same time every day to develop a routine and to keep the interval of expansion even. The key must be put into the appliance and pushed back as far as it will go to turn the expansion screw. If you feel a lot of discomfort or pain, stop turning the appliance and call our office. Use wax as needed. Dry off the area of the appliance that rubs with a Q-Tip and presses a small ball of wax onto the surface. Rinse with warm salt water the first few days and as needed thereafter (one teaspoon salt in a glass of warm water). Brush well around appliances and teeth. Swish with water or fluoride rinses to clean around the palatal portion. Rinse daily with a fluoride rinse such as ACT, Listermint, Flourigard, Oral B, or a generic. Follow the directions on the bottle. Avoid hard and sticky foods such as ice cubes, jawbreakers, gum, caramel, taffy, popcorn, peanuts… etc. As you begin to get some expansion you may notice a space developing between your two front teeth. This is normal, so don’t be alarmed! Dr. Murphy will close this space as you go through treatment. Your teeth and jaws may be tender the first few days of wearing the elastics. This is normal and should begin to disappear within a week. This will not get better if you are not consistent with wearing them. Rinsing with warm salt water will help take away the tenderness. It may seem hard for you to put on the elastics at first, however, it will become easier with practice! Elastic wear must be constant to be effective! 24 hours a day, 7 days a week, unless Dr. Howard and her staff indicate otherwise. You may remove the elastics only when eating meals or brushing your teeth. Leave them in during snacking. Be sure to replace the elastics with new ones immediately following mealtime and brushing. Part-time wear does NOT move teeth, but it does cause them to constantly be sore. Change the elastics routinely even if they are not broken. After a while, elastics lose their strength, so change them at least twice per day. Carry extra elastics with you at all times. If you don’t have enough elastics to last until your next appointment, please stop by our office to pick up more or call us and we can send more to you. We don’t want you to run out! Elastic wear is an important key to the speed of your treatment and the final results we can achieve. Please call Southern Maine Orthodontics if you have any questions or concerns! 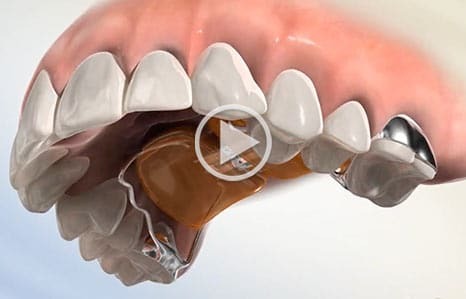 Forsus bite correcting springs apply a continuous light force providing comfortable, effective and efficient bite correction. They can potentially eliminate the need to wear headgear and significantly reduce the amount of time the patients will need to wear the elastics. They are easy to brush clean and because they’re positioned in the back of the mouth, they are not very visible to others. The length of time that a Forsus appliance is worn will vary depending on the amount of correction needed.